Typical Tank setup: Plenty of gravel and open swimming space, maybe a few plants with rocks and bogwood too. 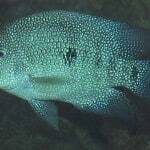 Compatibility: This fish will inevitably be moved from the genus Geophagus and it is not advisable to keep them with other true Geophagus. 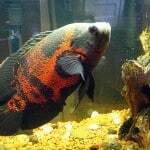 Geophagus brasiliensis is a more boisterous tankmate and certainly more aggressive at feeding time. 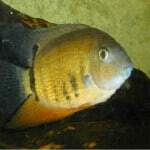 Although aggressive for Eartheater standards, it is not aggressive when compared to Central American cichlids. 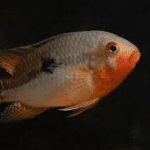 Feeding: Studies have revealed it to be a generalised omnivore with the natural diet composed of plant material, aquatic invertebrates (particularly chironomid larvae, ostracods and cladocerans), fish scales and fry. 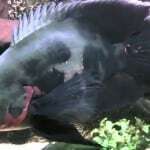 Sexing: Males grow larger than females, often significantly so, and most dominant specimens develop a nuchal hump to some extent. 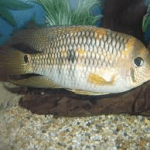 Additional Information: A great beginner fish, as it is not very picky about water conditions. 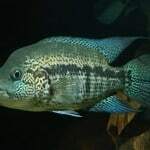 This species is also known as the ‘pearlscale’ or ‘mother-of-pearl’ cichlid in deference to the iridescent body scaling. 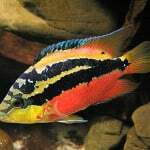 It’s also worth noting that fishes sold as Gymnogeophagus australis in Europe are ‘G.‘ brasiliensis more often than not. Wild specimens exhibits significant dissimilarities in body colour and patterning depending on locality with basic colouration being dominated by varying shades of blue, green or yellow, for example. Some populations also exhibit differences in body shape depending on the type of environment they inhabit, e.g., specimens from fast-flowing rivers and tributaries are more elongate than those from sluggish or stagnant waters.